Complete the form to download The Customer Data Too Often Overlooked by the C-suite. Why contact centre analytics is key to identifying opportunities for growth. In an era of big data, businesses collect information from more sources than ever before. But having access to data and effectively utilising that data are two different things. Many decision makers find that they have to make decisions without a clear picture of what’s happening in their business or what their customers truly want. 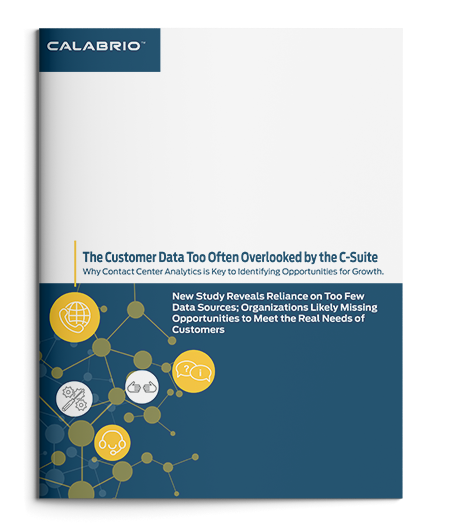 In Calabrio’s latest research report, The Customer Data Too Often Overlooked by the C-suite: Why Contact Centre Analytics is Key to Identifying Opportunities for Growth, learn from over 1,000 C-Suite executives in the U.K. and U.S., about the factors that compel change in their organisation and the data sources they rely on to inform their decisions. You’ll also learn the five steps that your organisation can take to transform your contact centre into a key source of customer insights and a driver of business change.